The TTC has partnered with Toronto Police to keep drivers from using their cellphones on the road. 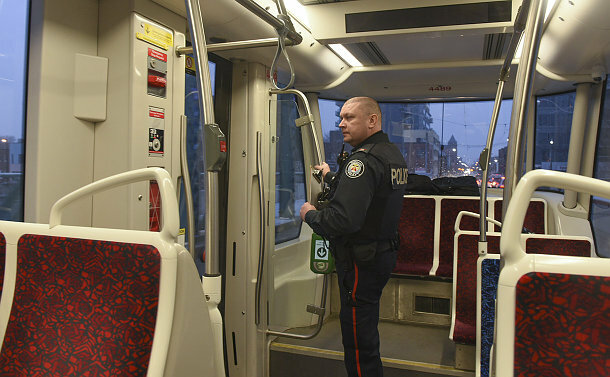 Officers have been riding TTC streetcars and buses during a traffic enforcement campaign to ensure drivers are not using a handheld device – a $615 fine. Drivers seem to be getting the message as police on a streetcar return trip between Lakeshore Barns and Long Branch loop on January 16 failed to nab anyone breaking the law. As part of a blitz to catch distracted drivers, Toronto Police Traffic Services collaborated with the Toronto Transit Commission to have officers ride on TTC vehicles to spot distracted drivers. A police spotter was placed on the streetcar. This is the first time that police has partnered with the TTC on a traffic safety initiative. “Other police agencies in Canada have applied it, but it’s a first for us,” he said, giving credit to the Waterloo Regional Police Service.